Step Up Your Summer with These Three Words: Grill. Your. Fruit. My entire kitchen-consciousness shifts in the summertime. And I wouldn't have it any other way. The mindset moves from something that is predominantly focused on the oven and range to one that is all about live fires, crackling wood, and smoke. This usually leads me to the meat and hard veggies side of my pantry and fridge. After all, it can be difficult to cook rice, quinoa, or other grains on the grill without special equipment, and I've yet to find a way to manage cheese over charcoal. 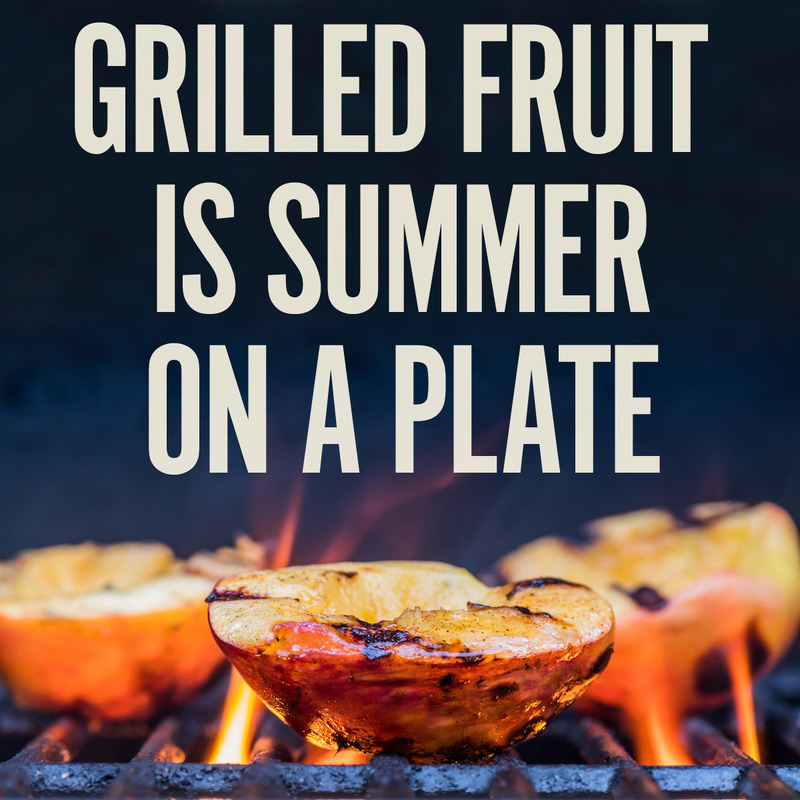 But an underrated grill item may be one that coincides with the best that summer has to offer: the explosion of ripe, delicious fruit that becomes available beginning in June. What live fire cooking offers is that unique application of heat when direct flame and indirect smoke work on food. To me this is all about sugars and proteins, which is why veggies and meat are such obvious grill food. The browning of a thick cut of steak or the caramelizing of a stack of onions allows to food to communicate a kind of direct heat you just can't manage in an oven or on the stovetop. Applying this to fruit is a little tricky. Fruits are generally juicier and more variable than vegetables. And the idea of using heat on fruit can be difficult to judge, depending on what you want. (This is like that time I decided to roast strawberries. Thinking I would get caramelized flesh and a syrupy liquid, I ended up with way too much liquid to ever let the flesh take on color.) So here are some examples of great fruit options for grilling, and a few ideas of what to do with them. This one is obvious. 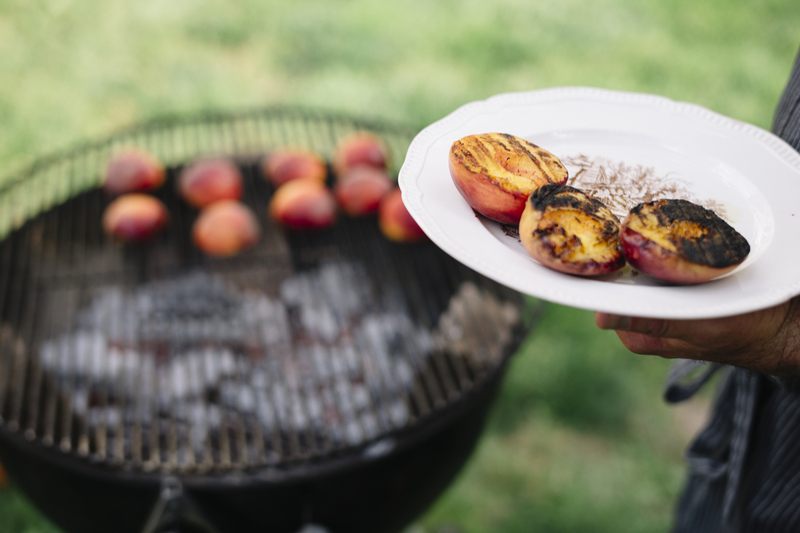 Grilled peaches are a perennial favorite––perhaps the only fruit application that is an ordinary grill application. But even so, it's worth putting first because it is absolutely amazing. You want a non-cling variety of peach that is just a day or two shy of being soft enough to eat. 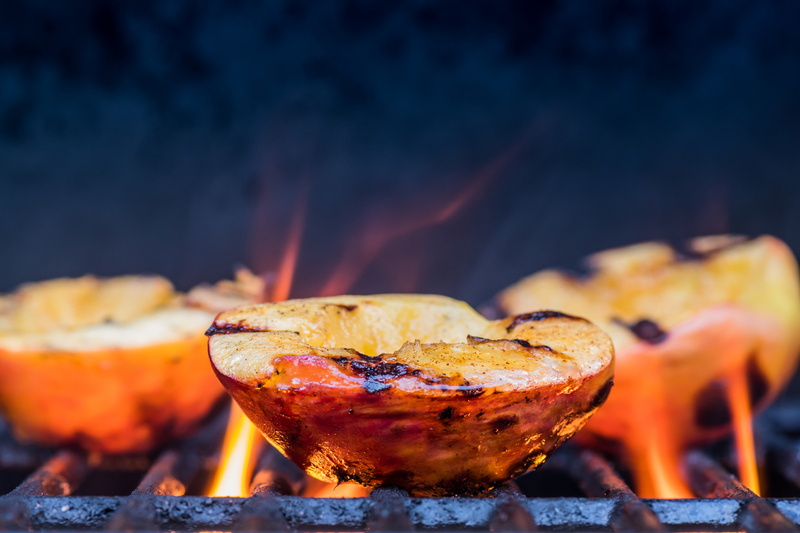 And once you've cut it in half and removed the pit, you can slap it right over the coals, turning a quarter-turn to get those great grill marks you want to see on a perfectly grilled peach. But if you want to make the most out of your grilled peaches, you want to pair the sweetened, grilled fruit with something smokey and salty––in other words bacon. So give this a try. Take a baguette and put your grilled (and somewhat deflated) peaches as a bottom layer. On top of them crumble some goat cheese along with crispy bacon and full leaves of basil. If you like a little heat, add some blackened or pickled jalapenos and top the whole thing with balsamic glaze. Then––to quote the inimitable Ham Porter from The Sandlot––you scarf. So, grilled and blackened citrus is kind of a magical thing. It transforms the flavor of an ordinary lemon into something a little sweet, a little bitter, and a thousand times juicier than it was before. If you are grilling any kind of protein, it's worth throwing a lemon half or two face-down on the hottest part of the fire to squeeze over the whole. But my problem has always been that this magic is fleeting. A grilled lemon or orange is a decoration––something on the side that looks and tastes great, but it's an addition. There is one way to really capitalize on grilled citrus though––turn that citrus into sorbetto. If you took, say, 3-4 large, red grapefruits and grilled them nice and dark, just like you would a lemon, you would be in a terrific place to make a grilled version of something like this. It's a subtle addition, but it is well worth capturing the smokey fruit in chilly, frosted perfection. As with peaches, the golden yellow of pineapple is a perfect canvas for some grill marks and some caramelizing heat. Pineapple is so dynamic as a fruit because of how much heat changes its taste. The raw fruit is refreshing and tart and tannic. The cooked version quickly turns into a candied sweetness that is caramel-y, but also floral somehow. Anyway, it's amazing. 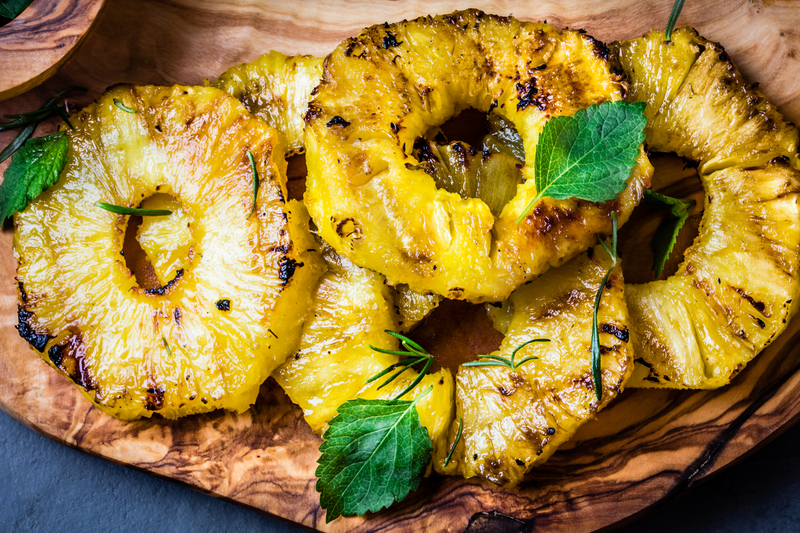 A quick tip for doing this well––leave the pineapple core in for grilling and cut it out afterwards. Once its grilled, pineapple invites warming, sugary contexts. So this is ideal for a legit dessert. I think the best bet is a warm, grilled pineapple upside down trifle. Make up some rich but straightforward poundcake (or buy from a good bakery) and cut it into a neat, sizable dice. Grill the pineapple until it is caramel-y and sweet and dice it up with as much of its juices retained as possible. Have some whipped cream and luxardo cherries ready to go. Start with the pineapple on the bottom, then the pound cake, a few cherries (and some cherry syrup), and finally the whipped cream. Its great to find a ways to pair different dimensions of flavor from the same ingredient together. Like, if you're making a tomato sauce, its great to put in some basil with your sofrito and then add some fresh basil at the very end––you get both dimensions of the herb. Well, how often is it you get to eat something that is imbued with the smoke from the sweet wood of the tree it grows on? You have the option with cherries, pecans, and apples. But cherries for my money are the ideal fruit for this. Cherry wood smoke is sweet, fragrant, and delicate. And putting cherries in a bath of cherry wood smoke is a chance to bring smoke and the deep, crimson-sweetness together. Here's the very simple way to do it. Place some soaked cherry wood chips in a tin foil pouch. Seal tightly, and poke a few holes in the top. Then, tear a large piece of foil, and place the wood pouch on the left. On the other side, add a pound of sliced or pitted cherries. Place another layer of foil on top, and crimp around the edges. Place on the grill so that the the wood-chip end is directly over the flame on your grill. Let them smoke for 45 mins to an hour. What emerges is a specialized ingredient. The cherries will give up a good amount of their juices, and you'll want to capture all of it and let the cherries marinate. The main use for these cherries and their juice is in awesome, creative cocktails. They will turn into an amazing, off-the-beaten-path old fashioned or Manhattan. You could include them along with another smokey element like an Islay scotch or an amaro to create something special.